Are you familiar with the acronym STEM? It’s very trendy because it is very important. Ask any teacher or student. Science – We study how things were made in the past and experiment with how to recreate them. We use chemistry to dye new fabrics, and to clean and preserve old ones. Technology – We use computerized devices to communicate and learn about dolls. Some of us attended a Virtual Doll Convention (with more to come). We often use sewing machines. Engineering – If sewing for antique dolls isn’t a feat of engineering, I don’t know what is. We use creative solutions to solve technical problems. Mathematics – This is what today’s post is about. I know that Math makes some of you squirm. Dolly Math doesn’t have to be scary or even difficult. Before I even got Lily Auguste(LA), I was doing dolly math. My brain was working overtime. I couldn’t wait to measure her. I started planning how much fabric I would need. Thinking about how much easier it would be to find bigger buttons and larger print fabrics. Would antique children’s shoes fit her? Since she’s my 29” version of an 18” Lily doll I needed to compute just how much bigger she is. DH reminded me that the numbers 1.61 are the first numbers in the Golden Ratio which recurs consistently in nature (remember the Fibonacci sequence from The DaVinci Code?). Coincidence, I think not. In Louise Hedrick’s book, A French Fashion Doll’s Wardrobe, she offers patterns for a 18” Lily doll with full stitching instructions. For some of the pattern pieces, I can just enlarge them on my copier by 161% and be done. However with LA’s grand size, most of the pattern pieces will be bigger than my printer can handle. It would print them onto multiple pages that I would then have to piece together. Or I could take them out to a professional print shop with a large-scale printer. Not fun or economical. Starting with her undergarments, most of the pattern pieces are composed of straight lines. So I just took each dimension and multiplied by 1.61 to make my pattern lines. But that required converting inches with fractions to decimals, multiplying by a decimal number, then converting the result back to inches and fractions of inches. Not fun. From a video I saw at the Virtual Doll Convention, I learned about using a Dimensional Scale. I thought that would help. I quickly ordered one and was quickly disappointed. It’s not as precise as I would like and it’s fidgety. What I needed was Technology. When I lamented to DH that I wished I had a calculator that would multiply fractions by decimals, he suggested that I find a construction calculator app. So I did. It’s Dewalt Mobile Pro and it does everything I need. I can multiply 4&1/4” x 1.61 without having to translate the fractions to decimals. And the answer pops up in fractions (The answer is 6&⅝”). On my iPhone, it was a free app. Yay! I bet the programmers at Dewalt Power Tools never imagined their app would be used for doll costuming. After size and proportion, I always consider the issue of SCALE. And this time, it threw me a curveball. I find it helpful to relate a doll’s size to human size. For LA, I imagine that she is a 12 or 13 year old girl in the late 1860’s. If I multiply her height times two, she would be a 4’ 10” preteen or enfantine. I think that’s reasonable, considering that people were shorter in the Victorian era. That gives me a reference point when choosing fabric prints, buttons or accessories for her. Just multiply by 2 and picture something of that size on a preteen girl. Put another way, take the size of an object that is human size and divide it by two to get Lily size. Oops. One inch buttons are quite large for a preteen human. One can picture a girl’s blouse having 3/8″ buttons. That would equal 3/16″ buttons on Lily’s blouses. That’s not happening! Then I remembered Sue Ann Twaite, aka Ladybug, whom I met at a miniatures show. She creates wonderful miniature fairies and their worlds. In the miniature universe, scale is everything, 1” = 1’, etc. But in Ladybug’s universe there is “fairy scale”. With fairies, scale doesn’t matter. A butterfly can be larger than a dog. An elephant can be smaller than a mouse. It’s a lovely concept. There’s also “Dolly Scale”. Anyone who has ever studied figure drawing realizes that dolls aren’t miniature humans. 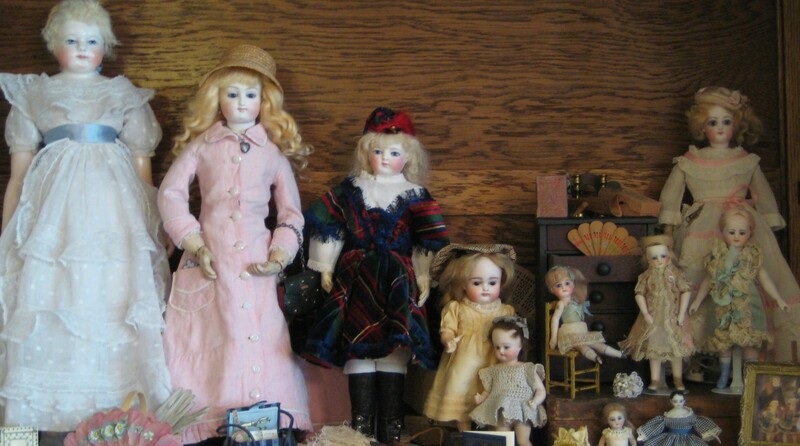 Just like Barbie’s measurements don’t realistically translate to human scale, neither do antique dolls’. The least proportionate parts of most dolls are their hands and feet. The are made small to portray a feminine “ideal”. Opting for Dolly Scale allows me some creative leeway when considering buttons. I’ve seen buttons up to 3/8” on a 4” doll’s dress and it can be charming. So, if I find some 1/2” (or maybe bigger) beautiful buttons, I will use them. So there. Actual mathematical scale is still a useful tool, but I won’t hesitate to switch to Dolly Scale when the need arises. I love your explanation of the process you are using to determine the patters, fabric choices and buttons.